Mayor-Elect Jim Kenney addresses the crowd during a press conference at Philadelphia City Hall. 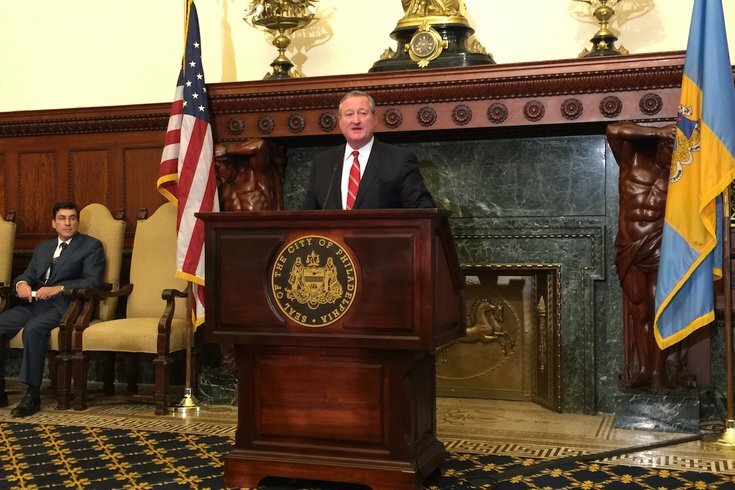 Mayor-Elect Jim Kenney, on the second floor of City Hall to formally introduce four new members of his cabinet-to-be, addressed rumors of the current administration’s apparent move to roll back Philadelphia’s “sanctuary city” status. According to a story in Al Dia, current “Deputy Mayor Everett [Gillison] told immigrant-rights groups and leaders from several immigrant communities that [Mayor Michael] Nutter is prepared to repeal his 2014 executive order” that barred local officials from cooperating with agents with the federal Immigration and Customs Enforcement. Kenney wasn’t having any of that, saying on Friday that, should the order get rolled back, he’ll put it right back in place after his Jan. 4, 2016, inauguration. His Philadelphia, he said, will not be one that abides by Donald Trump-ian visions of border walls. “I don’t understand the reversal, but I can’t speak for the mayor,” Kenney said. Mark McDonald, however, can, and did. Stories circulating in the community -- stories Kenney was being asked about -- don't really capture the nuances of what they're looking at doing, he said. Telling PhillyVoice that the administration doesn't even refer to Philadelphia as "a sanctuary city," McDonald said years of changes to related policies have left the city in a place where it's considering tweaking the executive order. However, that "slight change" has nothing to do with ICE holds; it would only focus on sharing information with authorities about whether someone they are looking for is in Philadelphia. "We had a conversation yesterday with advocacy groups where we talked about some ideas for slight changes within the executive order," McDonald explained. "They have nothing to do with detaining or releasing. It only has to do with the subject of notification." He said no decisions have been made. When the issue arose during the mayoral campaign, Kenney hearkened back to a time when his ancestors from Ireland encountered mistreatment when they arrived in America similar to what today’s immigrants face. “To me, [reversing direction on the order] is just going backwards, and it won’t be in place come Jan. 4,” Kenney said. While he and Nutter spoke about several matters on Thursday, “we did not speak in depth about this particular issue,” Kenney said. Saying he didn’t know whether Nutter was moving forward with it, he planned to catch up with him later on Friday.